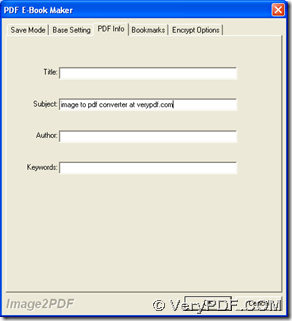 This article would like to introduce you 2 ways to convert image to PDF and edit PDF subject, which are the conversions with GUI interface of Image to PDF Converter and command line of Image to PDF Converter. To know more, please carry on reading this article. Next, to edit PDF subject with GUI interface, please click button of “Setting” > select “PDF Info” tab on setting panel, then in edit box of “Subject”, you need to type targeting subject of PDF there, finally, you need to click “ok” there so that this panel can be closed along with successful saving of this setting. 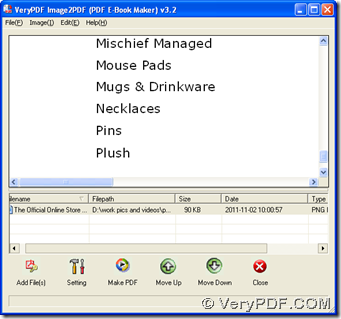 At last, to select destination folder and generate PDF file, please click button of “Make PDF”, and after you select “Convert one file into one PDF file” on dropdown list, please choose destination folder and click “save” in dialog box of “save as”, finally, along with the disappearing of this dialog box, GUI version of Image to PDF Converter can offer you proper PDF file. Img2PDF stands for path of “img2pdf.exe”, which needs to inputted for calling “img2pdf.exe”; [options] represents all parameters used to edit properties of PDF optionally; <-o output> is essential combination, where “-o” is essential parameter to produce PDF and “output” is objective path typed for saving PDF file; <images> stands for source path of image, which needs to be typed for adding image for process. where –j “verypdf.com” is parameter with string “verypdf.com” typed for editing subject as “verypdf.com”, and <enter> stands for one essential click on “enter” in command prompt window, which is used for starting process. This entry was posted in Image to PDF Converter and tagged command line, image to PDF, PDF Subject. Bookmark the permalink.